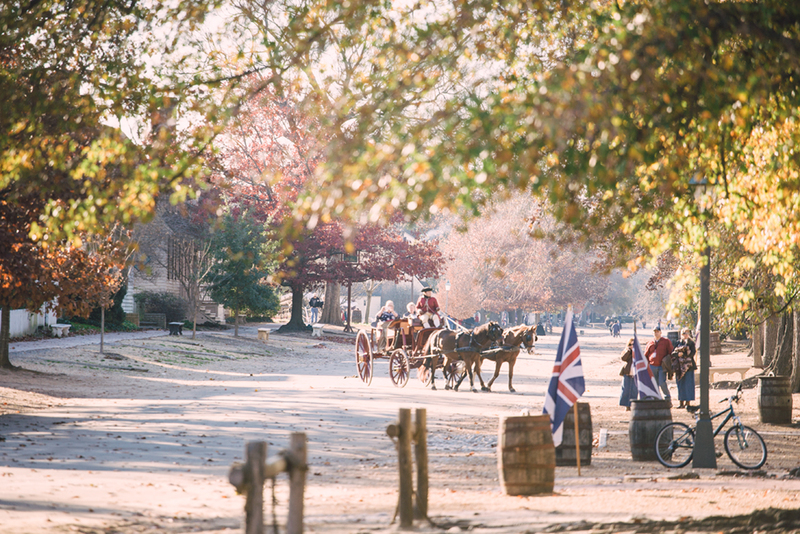 Spending a few days in Colonial Williamsburg during the holiday season was incredibly inspiring for a holiday decor enthusiast like myself. There were beautiful traditional wreaths made of pineapples, apples and pears, classic single white candles in each window, and simple pine bows filled with holly. My 12 year old self was full of joy getting to experience this town in the flesh after spending half of 5th grade writing reports, dressing in costume, and reading about the beginning of America. Adam and I left Lucille and Gromit behind with his Aunt and took the train from New Haven, CT into Grand Centeral Station for three days. We stayed with dear friends, Joel and Hailey in their new romantically simple Brooklyn apartment. Yes, romantically simple describes it perfectly. Mornings were the highlight of the visit. We slept in, sat on the kitchen floor with the morning light filtering though the old windows while Joel cooked a slow, perfectly drawn-out, four coarse breakfast of black coffee, smoothies, eggs, and cinnamon raisin toast topped with almond butter and honey. We spent a lot of time conversing about goals for our futures near and far. It's really unique/special when you can connect with friends this way to truly encourage one another to chase after their next dream. We left New York knowing we would miss and cherish this time with our friends and also feeling VERY motivated to continue on this journey and for what is to come. Adam has a very special Aunt and Uncle in Connecticut that we had been looking forward to seeing and getting to know better since we left on this adventure. Talk about hospitality, these two made us feel so welcome that I literally cried as we pulled out of their driveway after a two week stay. They were the first friends/family that we saw since getting engaged and we couldn't have asked for better people to celebrate with. They were waiting for us to arrive with Champange in hand! I don't often use the word quaint, only because I feel like it's over used and could be used to describe any small town form Nantucket to a village in Montana. But, that's the only word I've got for this area. It truly is a place to come slow down, take mid morning walks, admire the early settlement architecture, and take in the slow sea breeze coming off Watch Hill beach. We owe Aunt Anne and Don an enormous THANK YOU for taking us in for two weeks, sharing your beautiful home and energy with us, and watching over Gromit while we took a side trip to NYC. You two are an inspiration to continue laughing, traveling and drinking good wine for the rest of our lives. Cheers! Last week, I mentioned that I would share a couple photos from our weekend at a friend's camp in the Adirondack Mountains. Before you read anymore, you must know that the timing of this trip out to their cabin was a gift from the heavens. We had been driving eight hour days to beat the snow storms that were coming to the midwest, camping in Walmart parking lots out of accessibility rather than enjoyment, and neither of us had showered in six days. This weekend at the camp was nothing short of a five star resort in our eyes. This wasn't just any family cabin, it was a space that was created to foster friendships and bring family together for uninterrupted laughs, reading, cooking, swimming, and wine drinking. Adam and I were so blessed to have the opportunity to experience a small glimpse of the magic that happens inside the walls of their camp. We made it to Lake Placid about a month after the last summer stragglers had left. We knew it was going to be a cozy weekend when snow started falling on us while boating to the camp. Living in a trailer makes us really appreciate time in a home, especially having a full kitchen with room to dance. Thank you to Robin, our sweet friend from Santa Barbara and her family for opening up their home us! The drive to Acadia National Park was less than ideal. Pulling a trailer the day after 15" of snowfall is not the best idea. We took it really really slow and pulled over once to discuss whether we should keep going or turn back. I knew it was somewhere Adam really wanted to see so we decided to stay on course. The temperature dropped to below 30 degrees at night, thank heavens for our portable propane heater. It's name is Lil' Buddy and it can heat up Lucille in less than ten minutes. It was a really unique experience to see Acadia covered in snow. Most park visitors come in the Summer and Fall to catch the changing of the leaves. We spent over 12 hours hiking around the park and only saw two people and their dog. Just the way we like it! After hiking all day, Adam said he wanted to go for one more hike on the ragged cliffs above the ocean. It was so beautiful, we could see all of the islands, snowy beaches and natural harbors from up above. It is not uncommon for Adam to bring a tripod with him on a hike to set up specific shots and he had been using it all day. He said he wanted to take a few photos from where we were going to hike. While he does this, Gromit and I are used to hiking around or watching him meticulously set up a shot. While Adam was working on his camera, I was checking out the incredible view....then this happened! I said YES! I am so happy he set up the camera for this, it's a perfect capture of this perfect moment. Also, I had no idea he was going to do this, so it made this such a surprise and wonderful emotional moment. I am glad the camera only took one photo because the next one would have been a blubbery crying mess. I am so blessed God gave me a man like Adam! It's been a little over six months since we left our jobs, routine, and our friends and family for the open road. When Adam and I started planning this trip we both expressed our excitement for Maine. I wanted to go there for the seafood, lighthouses, and to buy a pair of L.L. Bean boots. Adam was most interested in surfing and hiking Acadia National Park. 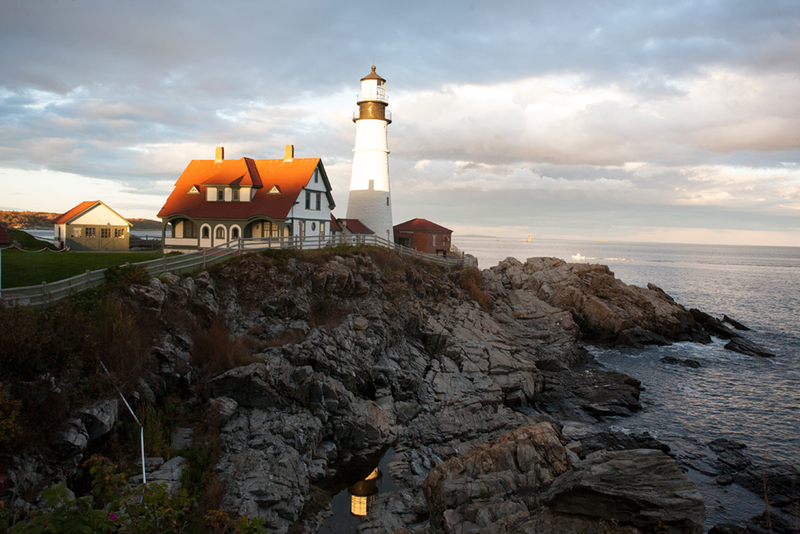 To us, Maine seamed sooo far away, geographically and time wise. We said if we can make it to Maine, we can do anything! Portland was the first city we visited and we fell hard for its maritime charm. The locals were so welcoming with dinner, brew, and even surf recommendations. All we wanted to eat was Lobster Rolls. Have you tried them? Oh my gosh, they are incredible. The first three days in Portland were gorgeous crisp Fall days; the other two were a bit shocking. The news pridicted a storm was moving in and there was potential for a little snow fall. With the storm came wind-swell that created perfect little waves. Adam was beyond stoked to surf in the snow! Air temp was 35 and the water was 55. Burrrr. It was a first for him and will not be the last. I feel like I am jumping WAY ahead by skipping a week of precious adventuring and unique photos from our travels in the Adirondack Mountains. For those of you that have been following religiously, I promise to share photos from Lake Placid, eventually. We want to share them with the owner of the "Camp" we were so graciously invited into first. Sooo, after that special time in the mountains we drove four hours east to Lake Champlain. On the New York state side lies the most elegantly rugged farm community called Essex. We had read a book about a Community Sustained Agriculture Farm in this town a few months prior and it made us both almost weepy to see the land in the flesh. It was simply gorgeous. We had plans to meet up with one of Adam's old surf buddies who now lives in Hinesburg, Vermont on the other side of the lake. Every half an hour a 10 car ferry is waiting to bring a load of commuters across the incredible lake. It was Lucille and Gromit's first ferry ride! After being snowed on in Lake Placid, we were fearful we missed the fall color in Vermont. It was such a pleasant sight to look across the water onto an autumn dusted landscape. It was a quick two day trip to the Windy City. We left Gromit with a friend outside of town and took the train in to stay with my cousin. The scene was dark and moody the whole time, which made for dramatic images and a lot of stops into coffee shops and one donut shop to warm up. Even the animals at Lincoln Park Zoo were feeling the shift in the season. The mountain lion sat on its perch and cried for a few minutes. It was a terrifying helpless sound. It is always a treat to visit a city, after being in the West for the last 6 months it was a big breath of smelly, vibrant, noisey air...in the most positive way. It definitely got us excited to run into big cities for two days more often--I think that's the only amount of time we could hang. I'm not sure what I was expecting from Madison, but I know whatever that was has been blown out of the water. From the resturants and breweries, to the two lakes the town is situated between, it has it all. Most fascinating of all is the neighborhoods and the unique architecture of each old home. We spent two days there and the majority of that time was spent going on walks to enjoy the fall weather and admire the homes. Here is a small taste of what we saw!! My brother and his wife are living in Madison while she finishes med school. On our way east we stopped to spend a couple days with them and celebrate their one week anniversary of being married. We celebrated at a restaurant called the Pig in a Fur Coat--to die for! The timing was dead on, all golden warm fall days. I've mentioned before how living on the road forces us to identify our essentials and rid our trailer life of the rest--a practice I will continue to do for the rest of my life. This was a piece of cake for me because I am not a "things" kind of woman...except when it comes to fur coats, leather vests, and all sorts of other clothing items I have accumulated in the past. So, what's a girl to do when you have to pack for all climates and occasions and only have three feet of shared closet space? It's all about choosing items that will be your trusty stead, that can withstand all activities and travel, classics and versatile, while remaining fashionable. - Tradlands 'Cambridge' shirt (pictured above), American made, classic cut that looks great with everything, also never wrinkles. - Stetson 'Moab' Hat, when it's been too many days without a shower. - Classic Short UGG boots, no explanation needed. - Buck Products Flapsack, my go-to day bag for a short hike, groceries, or beach day. - Wool Socks, there are no heated floors in the woods or in the trailer. I am curious, what are your travel clothing essentials? Hustling East on I-90 means early VERY cold mornings, ten hour drives, and too many sweet midwest farms to stop and drool over. We had to squeeze one last hike in Montana before heading East. It was an easy decision to walk to Turquoise Lake considering the name and length. It gave us enough miles to start sweating out the weekends madness along with time to spend the entire day in the mountains. We have so much gratitude for the time we had in Montana. It was such a blessing to give a month of undivided attention to family, friends, and to the mountains. Adam and I were both very excited to continue on down the road in Lucille, but it doesn't mean it wasn't hard to leave all of this beauty behind. It was an absolute pleasure to spend the day in Glacier National Park with my soon to be sister in-law's, Jen's, college friends. Bringing visitors to the park, especially those who have not been there before is so much fun. It is the most marvelous setting I think most will every see. The overall reaction from her friends and their gorgeous children was just that! Apparently, it is a requirement to be tall, brunette, and gorgeous to be friends with Jen. Good thing she has to be friends with me because she married my brother. We ended the trip in the park on Lake McDonald with a picnic, canoes and a not so competitive rock skipping competition. The week leading up to my brothers wedding was a tornado of merrymaking! Family and friends flocked in to our home town ready for a party. First order of business, evening booze cruise. There are hot springs and geysers, waterfalls, rivers and lakes around each bend in Yellowstone. After a memorable early morning soak in the Boiling River near the North Entrance we started our car-tour through the park. I've seen a handful of photos from the lower falls of the Yellowstone river and set my sights on getting there before dark. It's only a 40 mile drive to the falls, but we took our time, stopping at just about every water landmark on the way. Standing six feet away you could feel the intense heat radiating from the hot springs. I couldn't resist touching the water and quickly realized why there are barriers surrounding each pool. The hike to lower falls was simple, hence its popularity, and the first signs of fall color were scattered around the trail. The view at the vantage point below is mesmerizing. The power of the river made me think of a 100 foot wave breaking ten feet away. I've never been that close to that much water moving. After a day of hiking and a lot of driving we made the decision to press on to see Old Faithful do its thing. We were hesitant knowing it would be crowded and touristy, but it was a phenomenon we couldn't resist. The park rangers predicted its eruption to the exact minute and we sat shoulder to shoulder with hundreds of people from around the world in awe of mother nature. Well worth the visit! Last week, we left Lucille behind and took a slow beautiful drive through southwest Montana to Yellowstone National Park. As far as I am concerned October is the best time to visit a national park. The crowds were minimal, the animals were active, and the crisp air was changing all life right in front of our eyes. Last week also marked our fifth month on the road! Adam has started to take pictures of tortilla chips that look like waves. Poor boy has been away from the ocean too long.